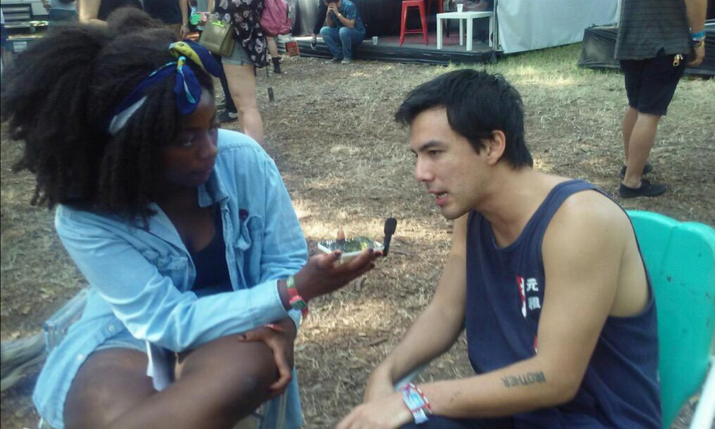 FIDLAR interview at ACL 2015. Photo by KTSW staff. How has ACL been so far? Well, welcome to Austin. You’re from California, so..
Well I’m actually from Hawaii, but it’s similar, So-Cal. When did you move to So-Cal? I did like Hawaii, but it was really boring though. If you’re not a touristm, it’s boring. How do you like Austin, in general? Austin’s great. Keep Austin weird, man. I mean the only time we’ve really been to Austin was for on tour. I would like to hang out here, and get to know the city a little bit more. The only relation we had with it for a long time was SXSW and ACL, and those were all crazy parties. I would love to check out the city more. It’s a really pretty city, and it’s pretty weird in comparison to others. How does Austin audiences differ from what you are used to in LA. Texas in general, is crazy. You guys have a lot of pent up aggression or something, man. Out of anywhere in the US, I think they are the most rowdy crowd, most definitely. There’s just something about it. Last night in Dallas it was just unreal. I was actually scared for kids. What was so crazy about it? They were just super rowdy. Some girl completely passed out. We had to stop mid song, get her out of the pit. So are the mosh pits really hard? Yeah, but not like angry. They just get excited, really excited. This girl was just passed out, she looked like she was dead almost, and security had to get her out of there. It’s going to happen. So you recently released Too around early September. What’s the difference between playing those songs then the ones off FIDLAR, your debut, when you perform? They are a lot more fun. It’s fun playing new songs. They are more melodic and dynamic, quiet, loud, quiet, loud. They are more personal. They are not just like, the let’s party type of thing. It’s a little different, but it’s good. I’m glad we are starting to play a lot of them, you know. There is still energetic, and fast song. How do you handle big festivals like ACL, compared to smaller venues? Sometimes I feel like I’m in high school. Like in catering, you go to the line and get your food and turn around and everyone’s sitting. There’s that band and that band is there, and I’m just like ‘uhh’. So I just sit by myself in a corner. Other than that festivals are a little different from regular shows, where you just suit up and play. I like playing festivals though. Do you perform differently? Do you feel like you have to be bigger for the crowd? I do. Unfortunately I feel like I have to win them over. So, I go a little bit harder at festivals. Yeah, because not everyone is a fan, they could just be walking around. How has your music changed, musically and lyrically, since your debut? We learned how to write a bridge, and also the dynamic thing. That’s important, loud, soft, loud, soft. I know when we toured with The Pixies, Frank Black told me ‘The Pixies have that loud, quiet, loud, quiet thing. You guys just have that louder loud thing.’ I was just like, maybe we should learn to be quiet so we can be louder. It’s just natural progression. You recently were on Jimmy Kimmel and you had two R. Kelly statues on stage. He’s my boy. We walk out to ignition everyday. It’s our ritual. Trapped in the closet is a masterpiece. There is no doubt in my mind R. Kelly will go down in the history of legends. I love R. Kelly. The dude can do it. So one of my favorite songs on the album is Sober, what song is your favorite and most proud of? Sober, I like Sober. It’s me basically having a temper tantrum. That’s my favorite. It was the most different, and the scariest to do. It turned out great though. It’s about my girlfriend breaking up with me when I was in rehab. It’s personal, but it is also funny looking back at it. If you could form a supergroup with any artist on the ACL lineup, who would it be and what would be the new name? Instead of a supergroup, Vince Staples and me could just start a business of Staples kiosks at ACL and have the button. Or you guys could just work at Staples. Maybe you could do press for them. That would be funny. He wouldn’t like that much. No, it’s just going to be a you thing. So you’re saying no supergroup, just a duo franchise. Just a chain with me and Vince. It’s mostly just Vince Staples though. Yeah, and me being a customer.